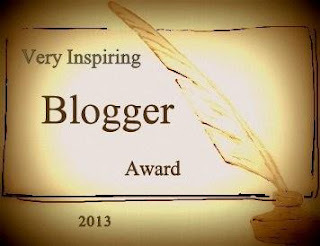 I've got another award and this is my first Very Inspiring Blogger Award. I was given it by +Teagan Kearney from my first novel no working title yet. She blogs about her writing but adds her own touches to her posts. I love reading her blog and you should all check it out! I get my inspiration from many different places. I think firstly I get inspiration from what I see and the people around me. I have to admit, I'm a big people watcher and think it helps with creating realistic characters. I also get inspiration from other books I read. I focus on how other authors write scenes and what works for them. I would never copy another author but I definitely take notice to what works. From doing weekly writing prompts and exercises, I've practiced creative writing which helps a ton. I find that I delve into my imagination and new ideas keep popping up more and more. I love doing prompts, warm ups and even making up my own prompts. It gets the juices flowing. How my blog inspires others? The whole reason I started writing my blog was to help others who are in my situation start the writing process and finish it. I started with a half written book and hopes to rise above and get a published book. I've blogged about my ups and downs and I think I've accomplished what I came for. I love helping people and teaching people my own lessons. I can only hope that I inspire others to write about what they love and give them confidence they need to do the same. Check out these guys blogs and show them some love! Also if you don't follow me on google connect or subscribe via email do so now! I need some support and soon when my book comes out I'll be doing some give aways and free stuff! Thanks again for all of the support. I truly love you guys.